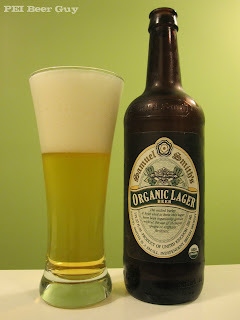 This organic lager is a very pale, clear yellow. There is actually a ton of frothy, white head on this one from the first pour (maybe the mineral quality of the water helps this as much as the proteins in it), and it leaves tons of solid, spattery (my new word for the day) lacing. There is a lot of mineral smell to it - almost chalky / limestoney- along with a bit of grain & honey. Maybe some light, fruity hops. Hops come through subtly but nicely, more so as light fruit notes rather than bitterness. Honey's still at play, too... some light grass, and just the faintest hint of something white-pepper-like. The body is light, and the finish / overall feel dry. It's a bit... strong, actually, in that the dryness & hoppy bitterness (light as it is) build a little and linger after you swallow. The carbonation - despite the impressive head - is pretty mild. A solid lager, but not my favourite offering from Samuel Smith's.